Lycium fruit is obtained from Lycium chinense, a common plant of eastern Asia that is now cultivated to meet the high demand for its fruits, used in Asian cuisine and, more commonly, as an ingredient in traditional Chinese herbal formulas. Lycium is in the Solanaceae family that gives us peppers, eggplants, potatoes, tomatoes, and other food items. The fruit is known by the Chinese name gouqizi, meaning the fruits of the willow-like shrub, and has been used since ancient times, recorded in the earliest existing Chinese materia medica published around 100 A.D. It was reputed to improve the complexion and vision and prolong life if taken regularly. Traditionally, lycium fruit is described as having the properties of nourishing the blood, enriching the yin, tonifying the kidney and liver, and moistening the lungs. It is applied in the treatment of consumptive diseases accompanied by thirst (includes early-onset diabetes and tuberculosis), impotence, sore back, dizziness, blurred vision, diminished visual acuity, and chronic cough. In China, treatment of bone marrow deficiency conditions (low production of red blood cells, platelets, or white blood cells, often the result of cancer therapies) with herb formulas frequently involves lycium fruit as a major ingredient. The fruit contains beta-carotene, vitamin C, vitamins B1 and B2, beta-sitosterol (an anti-inflammatory agent), linoleic acid (a fatty acid), immunologically active polysaccharides (5-8%), sesquiterpenoids (cyperone, solavetivone), tetraterpenoids (zeaxanthin, physalin), and betaine (0.1%). Chinese pharmacological research shows that lycium extracts administered to mice could enhance non-specific immunity, promote production of red blood cells, increase production of interleukin-2 (IL-2), and reverse the inhibition of white blood cells caused by cancer drugs. The principal active components are polysaccharides, betaine, and physalin. In a review of research on lycium fruit appearing in Recent Advances in Chinese Herbal Drugs, Dr. Zhou Jinhuang points out that polysaccharides from lycium fruit, like those from astragalus and ganoderma, enhance cell-mediated and humoral immune responses. Lycium fruit polysaccharides could increase activity of T-cells, cytotoxic T-cells, and natural killer cells in laboratory animals. In a study of lycium reported in the Journal of the Beijing Medical University (1992), it was noted that lycium fruit reduced antibodies associated with allergy-type reactions, apparently accomplished through the mechanisms of promoting CD8 T-cells and regulating cytokines. This effect may explain the basis for the reports that lycium fruit is useful treatment for psoriasis. Betaine, when added to chicken feed, enhances growth of the animals and increases egg production, and it is currently used in poultry farming because of these effects. Lycium fruit given to rats lowered their blood cholesterol and blood sugar; given to rabbits, it inhibited the formation of atherosclerosis. Betaine was shown to protect the livers of laboratory animals from the impact of toxic chemicals; other pharmacologic studies have shown that it is an anticonvulsant, sedative, and vasodilator. In 1974, it was reported that betaine could treat various chronic liver diseases; lycium fruit is often administered with another Chinese herbal fruit, schizandra, for that purpose. In recent years, betaine has been included in some Western nutritional supplement products, especially those used for improving muscle mass. Betaine is an alkaloid, sometimes classed as an amino acid, that is found also in capsicum, silybum (the source of the liver-protective flavonoid silymarin), and beets (Beta vulgaris, from which betaine gets its name). Betaine is used by the liver to produce choline, a compound which calms nervousness, enhances memory, and protects against fatty liver disease. 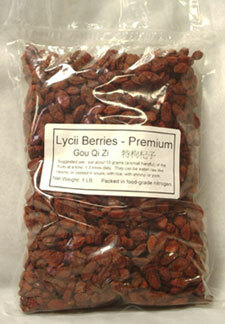 Like other commonly eaten fruits, lycium is non-toxic. Toxicity studies showed that injection of 2.4 grams/kg of lycium fruit extract did not cause adverse reactions; only at the huge dosage of 25 g/kg were toxic reactions rapid. The LD50 was determined to be about 8.3 grams/kg (corresponding, roughly to about one pound of the dried fruit, extracted and injected, for a human). There is a single report of high dose lycium fruit as a possible cause an elevation of blood levels or effects of Warfarin (coumadin). When making a decoction (tea prepared by boiling the herb in water), 6-18 grams of fruit are used for a daily dose, usually in combination with other herbs; taken for one to three months as a typical course of therapy. In the treatment of atrophic gastritis (weakened digestion due to reduced activity of the stomach cells), it has been used by having the patients consume the whole fruits, 10 grams each time, twice daily before meals for two months. In the treatment of diabetes, steamed lycium fruit is eaten in the dose of 10 grams each time, three times daily (steaming softens the fruits, but this may not be necessary). 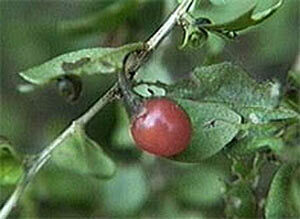 Lycium fruit has been given to treat sexual impotence. It was reported that by consuming whole lycium fruit or an alcohol extract of the fruit, it could markedly increase androgen levels in the blood, making patients feel more energetic. It is likely that sitosterols or terpenoids are responsible for this effect. Further, the polysaccharides of lycium are believed to protect against infertility associated with aging. The daily dosage of lycium fruit needed to obtain these various beneficial effects is about 10-30 grams per day (a small handful of fruits is about 10 grams). Duration of therapy is one to three months. 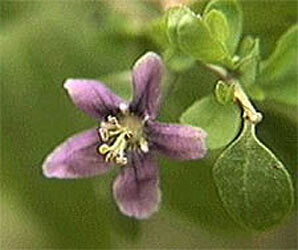 Lycium is also used in anti-aging formulas, consumed for years.